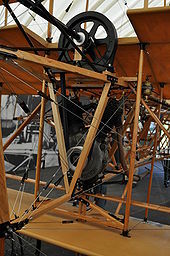 The Roe I Triplane (often later referred to as the Avro Triplane) was an early aircraft, the first all-British aircraft to fly (Roe's previous biplane had a French engine). It featured not only a triplane wing, but a triplane tail as well. It was of extremely flimsy construction; financial hardship compelled Roe to use wood for structural elements where he would have preferred steel, and the wings and fuselage were paper-covered. Roe nicknamed the aircraft The Blues after the braces manufactured by his brother's firm that had helped pay for it. Beginning on 5 June 1909, he made a series of short hops on the Walthamstow Marshes (then in Essex, but now within the London Borough of Waltham Forest). The triplane's wings were damaged by crashes during these attempts, but Roe persevered. On 13 July, he achieved a flight of 100 ft (30 m), and ten days later, one of 900 ft (280 m). With confidence building, he swapped the original 6 hp (5 kW) JAP motorcycle engine for a 24 hp (18 kW) Antoinette. With this engine, he piloted the aircraft on several short flights at the Blackpool Meeting in October before it was damaged beyond repair in a crash at Wembley on 24 December. Roe constructed three more machines to this design, powering them with ever-larger JAP engines. 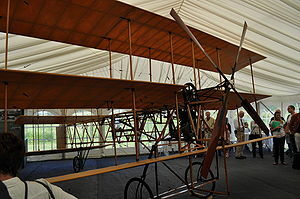 On 12 July 2009, an event was held on Walthamstow Marshes to commemorate the first all British flight under the auspices of the Royal Aeronautical Society, with several generations of Roe's family in attendance. A new historic marker was unveiled on the northern entrance to Roe's former workshops in the railway arches. One example is preserved at the Science Museum in London. 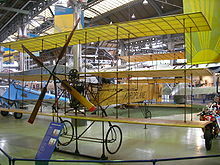 The Museum of Science and Industry in Manchester has a full-scale replica on display, made by apprentices in 1952 to resemble it as it appeared in 1909 at the Blackpool Aviation Meeting. Roe I Triplane Pictures and Roe I Triplane for Sale.